Although some butchers and cooks will use the terms flank steak and London broil interchangeably to describe the same cuts, the two are not at all synonymous to the culinary pedant. As its name suggests, flank steak is a cut from a specific area of the cow, while London broil is a method of cooking various lean cuts similar to and including flank steak. Flank steak comes from the lower section of the cow, below the succulent loin but before the muscular sinews of the round: a tough but lean steak with very little fat marbling. Although it might sometimes be seen as more of a budget steak for home cooking, rather than one championed in restaurants, flank is beautifully tender if cooked properly, and amply responsive to marinades. The key is not to overcook it -- in which case it will toughen beyond repair -- and to slice it thin against the grain of the muscles. For the purist, London broil should only refer to a method of cooking, typically for flank steak, top blade and top round. 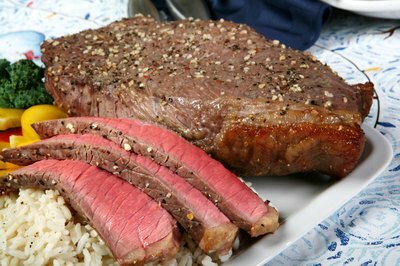 Less common is to use London broil to describe the marinating process itself, prior to grilling or broiling. Because London broil steaks are too small to roast and don’t come from the fatty loin, they need patient marinating followed by pan-frying or grilling to medium-rare at most. Whereas a rib-eye, for example, has enough marbling to stretch to well-done grilling, London broil steaks struggle to retain their moisture and never benefit from cooking through. Slicing them across the grain keeps the moist, juicy cuts tender. While London broil reaches the plate as thin slices with a flush of pink, cooks can choose from a handful of big, thick and cheap cuts for the purpose. Because flank steak is not arranged around a bone or tamed by a fat rind, it is flexible and versatile to work with. As with skirt steak, flank delivers lean, uniform cuts ideal for fajitas. The key is to marinate for up to 12 hours in a salty, spicy blend of soy sauce, chili pepper, lime and herbs, with six minutes on a hot grill enough to bring the internal temperature up to a safe 125 degrees Fahrenheit. For a Colombian-inspired twist, marinate the steak in dark beer, cumin and green onions, for serving with aji and guacamole. For roasting, flank can be butterflied and rolled around a roulade of nuts, herbs and chopped salad leaves, the filling moist enough to sustain an hour in the oven. London broil can be marinated well ahead in the refrigerator, absorbing a variety of flavors that ideally include salt, sugar and acid. The New York Times recommends soy sauce, brown sugar, mustard and balsamic vinegar. However, it should be cooked from room temperature, and cooks might need to cut away any connective tissue depending on the steak, and pound it with a mallet to give a uniform thickness. As an alternative to marinating, a dry rub of salt, pepper and a little mustard also works wonders before pan-frying in a hot skillet. Rubbing with a little butter will give the steak some fat to brown in, since the meat itself produces very little. As with any steak, cooks should allow the finished steak to stand for the juices to be absorbed. If stewing, marinate as usual but be prepared for a long, slow cook in a Dutch oven for up to five hours to yield fall-apart chunks of meat. The Kitchn: What’s the Deal with London Broil?